Please stop here: This guide assumes you have some knowledge of selling on Amazon. If you don’t know how to sell on Amazon, this FREE guide can help you: http://www.sellfba.com/jm.html OR you can take this (highly recommended) course: http://Amazon-Course.com. 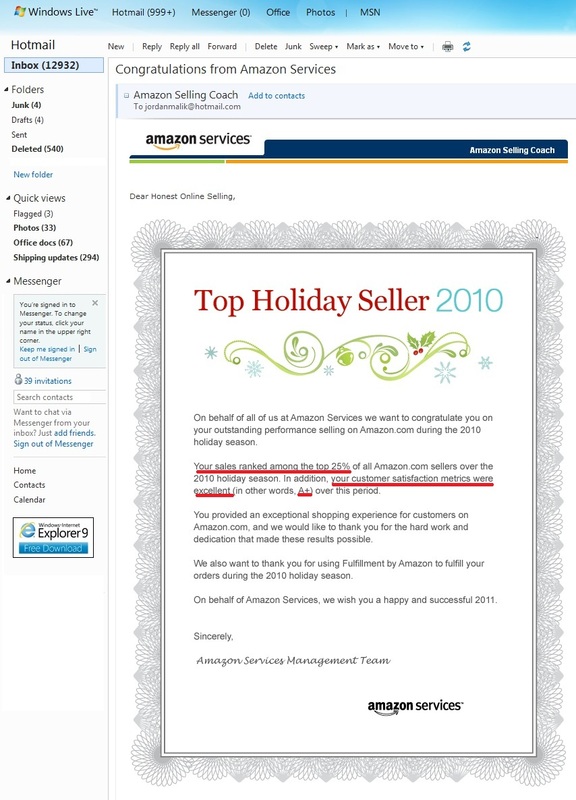 > In 2011, I founded FBAFinds.com, the site that tells Amazon.com sellers ‘Exactly What to Sell on Amazon and Exactly Where to Find it.’ FBAFinds is the 4th-highest ranked service at independent review site http://IMReportcard.com. > My Amazon FBA Pro Merchant ID is Honest Online Selling (see http: //bit. ly/honestonline) Check that out, you can see my recent Amazon buyers’ feedback, and my items for sale. Now, are you ready to talk about Sales Rank? Good. The truth is, every Amazon seller is going to have a different opinion on what the ideal sales rank should be for inventory they are about to purchase. And you’ll eventually have your own strategy too. Amazon.com uses a secret formula (yes, it’s really a secret and no one has figured it out – yet) when they assign a sales rank to an item – but generally, we know: the lower the sales rank number, the ‘hotter’ the item is. (So a sales rank of ‘1’ would be an extremely hot item). Anyway, books can have sales ranks as high as around 12 Million (that book would be a sales ‘dud’ – something that you probably couldn’t sell even if your price was $.01). Other categories like DVDs and Toys’ sales rank probably go as high as around 1 million or so – those would also be ‘duds’, or extremely slow sellers/nonsellers. Amazon.com’s web site, and looking up the item (via entering the item’s UPC code into the search field). should only use mine as a guide, because the more you buy and sell, the more of a ‘feel’ you’ll get for sales ranks that suit just you. What you shouldn’t do is immediately refuse to sell an item (like a book) that has a sales rank of (say) 900,000, because you might be missing out on an opportunity if there are NO (or, say, up to 3) other merchants selling the item, and hence the product’s number of competing sellers and/or available inventory are very low. If only one Amazon customer comes along and sees there’s little or no inventory, well he could have bought the item from you and you would have little or no competition. In all Amazon.com product categories – I first make sure my Amazon selling price can be 2.5x to 10x what I paid for it. But that ‘2.5x to 10x’ varies according to how little or how much I paid for the item. For example, if I paid (say) $.50 for a book, I want to ensure the selling price is at least $5 (or 10 times my purchase price), so it’s worth my while. At the other extreme: If I paid (say) $50 for a toy, I want to ensure the Amazon selling price is at least $125 (or 2.5 times my purchase price), so it’s worth my while. > The book is in relatively good sellable condition. The reason I do this for books is that Amazon storage fees (for FBA Sellers) for books (and all media) is very negligible (it amounts to pennies per month per book), so it costs me nearly nothing for me to keep a book that ranks (say) 400,000 in Amazon FBA storage for 6 months or a year before it sells. > The CD/DVD/VHS Tape is in relatively good sellable condition. profit proof for you – believe me you will be shocked! http://jordanmalik.com/blog/?p=115 (An audiocassette bundle – with a sales rank of3,800,000 (that’s not a typo) – that I also quickly sold. Well, thanks for reading this – I really hope I’ve helped you.